Plan your novel in 30 days and write with confidence! "This course helped me get out of my writing rut. I am not one to outline or get to know my characters before writing. By taking this course I learned that plotting and characterization can be fun. Now I find writing to be fun again. Thanks. " We know that you have other activities in your life besides writing, and that writing your novels is important to you. How can you manage your writing and still meet your other obligations? Well, you can, in small, manageable bite-sized pieces. Each lesson in this course can be done in as little as 15-20 minutes. That's why this course is designed for the writer with a life. You can plan your novel in a way that fits into your life. We know, because we’ve done it, multiple times! In our 30-Day Writing Challenge, we will help you think and write through the steps to create your novel – from character development to plot structure to story themes and world building — so that you can start NaNoWriMo prepared. For: Experienced writers or ambitious writers who want to plan their novel in an organic or step-by-step way, so that on April 1st you can start writing it alongside the CampNaNo.org crowd. What can you expect: You'll put pen to paper, or fingers to keyboard and write while you think, in specific ways, with specific focuses. Words will pile up, along with ideas, story questions, and scenes. You'll be invited to read short lessons, watch some video or listen to the lessons, then write — put pen to paper, or fingers to keyboard and actually do some thinking of your story on the page. -- You have never written a novel, and have always wanted to, and still feel lost on how to go from brilliant idea to The End, then you will be stretched in new and different ways. -- You're an experienced novelist, with 1 or 2 completed or partially completed novels under your bed. You may find this course structured in a way that's new to you and yet familiar. -- You have 3 or more unfinished novels sitting in a drawer, and always hit that sagging middle and lose focus or lose interest. This course will help you dream up exciting ways to torture, I mean challenge, your characters all the way to the resolution of the story. A 30-day course, structured so you can do it at your own pace. All told, if you follow the curriculum and attend the live workshops, you will probably spend 10–30 hours over the month to follow through on the assignments and exercises, all designed to help you plan your novel. Of course, some of you will spend less and some may spend more time on this course. Mark your calendar for the 4 (four) Tuesdays in March 2019. Calls will be 5:30-7:30pm Pacific / 8:30-10:30pm Eastern, and last from 90-120 minutes. All workshop calls take place on Zoom, a free-to-you service. You'll get the specific Zoom link once you sign up. If you've enrolled in our home study course, you'll get a discount to the live course we run every year. Week 1: Elevator Pitch & Short Synopsis We help you write the 1-2 paragraph story blurb, also know as the elevator pitch, that you can later use in a query letter. Next we cover the 5-6 paragraph story synopsis that can form the basis of a synopsis agents and editors request. We also touch on the story's theme and genre to help you have a better idea of the focus of your story and also your audience's expectations. Week 2: Get to Know Your Main Characters We cover getting to know your main characters. Great stories start with great characters that you love! We offer up "10 Key Questions to Ask Your Characters" tip sheet (PDF), plus more character questions and special exercises to help you get to know your characters so you can bring them to life when you write your novel. Week 3: Story Plot & World Building We help you design the story's main plot points and get to know the world of your story better, in other words, world building. Plot comes from characters, from knowing your story world, and from asking some good questions. We help you design a plot that will keep readers at the edge of their seats turning pages deep into the night. Week 4: Scene-by-Scene Outline & Plotting We guide you through the final preparation step of building your story scene-by-scene. We help you create an organic outline from all the notes and thinking that have gone before and also provide tips on a more linear approach to plotting your story. Once you have completed this exercise, and all the ones before, you'll have a good sense of your entire story, and can sit down to write your novel with excitement and confidence. 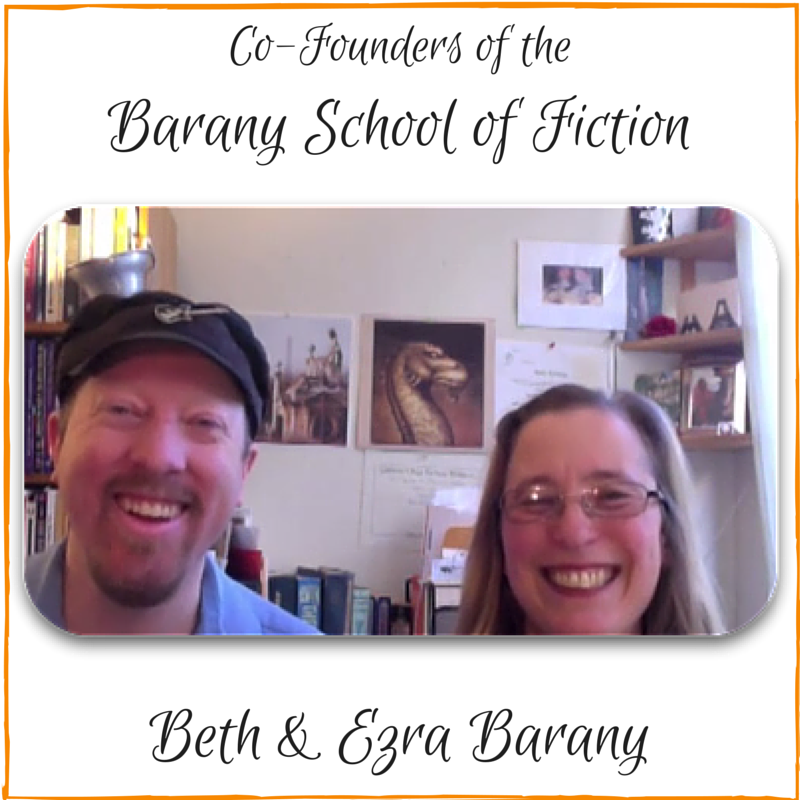 This course is offered by Beth and Ezra Barany, writing teachers and novelists. We walk the talk. We're award-winning, best-selling novelists, who have worked with over 300 authors to help them get their books written and published. Happily married for over 18 years, we're passionate about writing, story telling, and guiding authors to achieve your dreams. Together we have written and published 20 books, plus 3 audio books. Together and separately, we have taught thousands of students over the years, in both the public and private sector, including overseas in Paris, France. We both teach (and Beth's case, coach) and working on writing and publishing our novels. -- All new updates and lessons! "I want to thank Beth Barany and Ezra Barany for taking the time ... Their encouragement helped to get me on the stick and get ready to write my novel." "Beth and Ezra are super accessible... and they have great ideas for guiding an author's success. It's been fun to virtually meet other creative writers as well. The support is fabulous ... a real community." "“It's exclusively due to taking this course that I took the plunge to write my very first fiction writing piece. I wouldn't think of starting book two of the series I'm planning to write without taking your upcoming course being offered in October!”"
2019 March Course Calls Will Go Here! Learn to craft characters your readers can fall in love with. This course is especially for genre novelists. This live calls portion of this course starts on March 1, 2019 and finishes on March 31, 2019. For all the contents, you have access for as long as the school is running. When are the workshop calls? Mark your calendar for the 4 (four) Tuesdays in March 2019. Calls will be 5:30-7:30pm Pacific / 8:30-10:30pm Eastern, and last from 90-120 minutes. All workshop calls take place on Zoom, a free-to-you service. "Just wanted to say thank-you to Beth and Ezra - I have really enjoyed your course. ... I especially enjoyed the weekly tasks, which allowed me to take time and really delve into my characters' motivations and conflicts." "[Plan Your Novel] course] offers a structure that allows for creativity and compassion for the struggles that come with writing. I learned how much more fun writing could be once I had a detailed map to follow. And how much fun you are, and your sense of humor. And how you are willing to share your struggles." A Personal Message from Beth Barany: I believe that we are all creative, and that if you dream of writing a novel, you owe it to yourself to start today. Our course is designed to get you moving with small writing activities that directly relate to building your story, so you can step into your creative dream today.